A few weeks ago I took a course on color correction, and I don't think my eyes will ever be the same again. I learned a lot during the course, but it didn't really effect me until I started doing the color correction for my documentary. Now I just can't see colors the same way I used to. I'm hyper aware of color changes in T.V shows now, and I completely don't trust my own eyes. 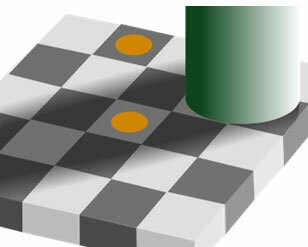 The two gray squares with the yellow dots are actually the same color, but our brain tricks us into thinking otherwise. It's super trippy, and this type of realization can really make you question the way you see things. Now that I'm beginning to understand color more, I'm not sure I can ever return to seeing it the same way.